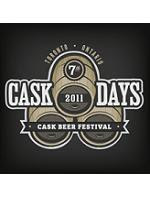 Tickets are now available for the 7th annual edition of Cask Days, Canada’s premier cask beer festival. Now, too large for founding pub barVolo, the event is being held for the first time at Hart House on the University of Toronto campus. With more than 50 casks available for sampling, breweries from across Canada will be represented, including Amsterdam Brewing, Beau’s All Natural Brewing, Great Lakes Brewery, Dieu Du Ciel!, Benelux, Central City Brewing, House Ales, Brasserie Hopfenstark, Les Trois Mousquetaires, Black Oak Brewing, Granite Brewery, Barley Days Brewing and F&M Brewery. There will also be a number of advance events in Toronto and elsewhere, starting with a Cask Days section at Beau’s Oktoberfest on September 30th to October 2nd.